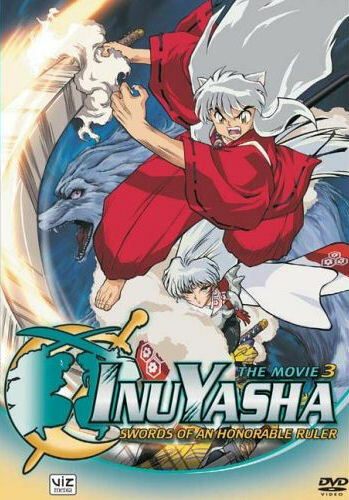 The film opens with events that happened at InuYasha's birth. The suitor Takemaru kills Lady Izayoi just before InuYasha's father arrives. InuYasha's father, still injured from his battle with Ryūkotsusei, arrives and resurrects Izayoi with the Tenseiga, telling her to escape with their son, whom he names as InuYasha and gives her the Cloth of the Fire Rat to protect them from the burning palace. InuYasha's father dies in the burning down of the castle as he moves to face Takemaru and draws his third sword. In the present era, Kagome's grandfather comes by with a sword which he calls a "national treasure"; as Grandpa is about to put it in the storehouse for "safe keeping", Kagome's younger brother goes over to the sword, and it speaks, or more accurately, the spirit of the sheath, Saiya. With his seven hundred year spell on the sword So'unga failing, Saiya seeks out InuYasha, hoping he has the willpower to control the sword. Unfortunately, he was mistaken, as it tried to possess InuYasha, but InuYasha tried his best to resist being controlled and finally brings the sword back to the past, but in the process unleashes the deadly Dragon Twister on an evacuated village, a technique far more powerful than the Tetsuseiga's Backlash Wave or the Tenseiga's Dragon Strike. Sesshomaru is also alerted to the return of So'unga, and he follows the scent to find that InuYasha is in possession of the sword. The two of them duel and at a crucial moment, Kagome, having returned with Saiya, saves the day and forces the So'unga to release InuYasha from its grasp. As InuYasha and Sesshomaru depart their respective companies to seek out So'unga, Myoga, Totosai and Saiya explained that explain to everyone that in the aftermath of InuYusha's father's death two hundred years ago, they carried out his last commands for his three swords. While the Tetsuseiga and Tenseiga were taken care of, Saiya claimed that there were no instructions for how to dispose of So'unga. Unable to give it to InuYasha or Sesshomaru, Saiya decides to keep So'unga asleep for at least seven hundred years and had it thrown into the Bone Eater's Well, where it ended up in the possession of Kagome's family.